What do the Codes say (because it seems no one really knows)? Fire pump. The very words make some Clients shudder. Not only are fire pumps expensive (hence the shudder), but they are also grossly misunderstood. Some of the challenges that face an Engineer, Architect, or Owner with fire pumps is the fact that their requirements are shrouded in codes referenced by other codes referenced by other codes. When water services have sufficient volume of water, but the flow test data suggests there is insufficient pressure available from the water utility, a fire pump comes into play. The fire pump will boost the pressure available from the utility to provide the pressure required to accommodate the fire sprinkler or standpipe system in a building. 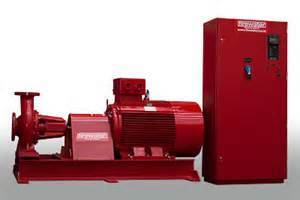 Fire pumps can be electric motor-driven or diesel engine-driven, but most of the time in the commercial environment we see electric motor-driven centrifugal pumps installed. So, let's start at the top and review how the codes work in New Jersey (other jurisdictions are most likely similar). The New Jersey Uniform Construction Code references Subcodes that are adopted to set a standard for the design and construction of buildings. The current Building Subcode is an amended version of the International Building Code (IBC) (2009 Edition- but not for long). In Chapter 9 of the IBC, the Subcode sets the standard for when automatic fire suppression (sprinkler) systems are required. When they are required, the IBC references NFPA 13 (2007 edition) Standard for the Installation of Sprinkler Systems. So, you check Chapter 9 of the IBC and it says you need sprinklers. Then you go to NFPA 13 and review the installation standard. NFPA 13 says when a fire pump is required, you need to follow NFPA 20 (2003 edition) Standard for the Installation of Stationary Pumps for Fire Protection (if you haven't noticed, when standards reference other standards that reference other standards, the referenced editions get older and older!). OK, so now this where NFPA 20 gets good. When a fire pump is powered by electricity it indicates if one source of power is not reliable you need to provide a second source (I guess it's OK to serve it with two non-reliable sources of power...). Now, this is in concert with the National Electric Code (NEC), NFPA 70 (New Jersey's Electric Subcode). If one of your sources of power is an onsite generator, NFPA 20 references NFPA 110 (sigh, I know) Standard for Emergency and Standby Power Systems. NFPA 20 indicates you need a Level 1,Type 10, Class X type generator (huh? ), it also requires a minimum of 8 hours of fuel. All right, let's breakdown the NFPA 110 classification. Class X means the runtime of the generator is defined by something else- luckily for us, we know the runtime is 8 hours. Type 10 means that the time from when the utility power is lost and the generator restores the power is at most 10 seconds. Finally, Level 1 means that if it fails, it could result in the loss of human life. Besides these standards, NFPA 70 mimics NFPA 20 by saying an electric motor driven fire pump requires a reliable source of power or multiple sources. That's about where the similarities end... The fire pump section of the NEC indicates that if you need a generator it refers to it as a standby generator (WHICH IN NO WAY CORRESPONDS DIRECTLY TO NFPA 110 CLASSIFICATIONS). However, elsewhere in the NEC an informational note indicates that emergency generators feed fire pumps, contradicting the previous language (AND AGAIN IN NO WAY CORRESPONDING DIRECTLY TO NFPA 110)... However, emergency generators (per NEC) require on-site fuel source, unless the Authority Having Jurisdiction approves an off-site fuel source. What does this all mean? When you have a fire pump you are required to have a reliable source of power. If you do not have a reliable source of power, you need two sources. If you choose (choose is the key word) to have a generator provide a source of power for the fire pump, it is an emergency generator (per NEC) or a Level 1, Type 10, Class X generator (per NFPA 110). You most likely need a generator with on-site fuel source. If you really want a natural gas fired generator, the Authority Having Jurisdiction will need to determine whether the potential for natural gas interruption is high. There is nothing that says, "when you have a fire pump and a generator, the generator needs to serve the fire pump." What you need to do is make sure your Engineering consultant is up to speed on the currently adopted building code, the older sprinkler standard, the older-than-that fire pump standard, the older-than-that-and-the-other-thing generator standard and ultimately coordinates with the Fire Subcode Official. So, it's a mess and the only way to make it easier is to hire someone who knows these standards and will help you navigate the requirements. Recently, I've been dealing with a significant number of issues with changeover-bypass VAV systems. This is what Carrier made popular with the term VVT for Variable Volume and Temperature. Trane also has a solution referred to as VariTrac. The problems that I've seen are typically based on unmatched expectations for the system... Years ago on a trip with Trane, when I asked one of the Representatives about Trane's solution, they responded, "What, the poor man's VAV system?" So, you would buy a constant volume unit, because that's how they made them. The problem with a constant volume unit is that you get one thermostat to tell the unit to provide heating or cooling and you put that thermostat in one place. No matter what you do, someone will think that the placement is wrong... In a commercial environment, to meet the ventilation requirements you have the fan run continuously (or "Fan On" on the thermostat). The unit brings in some outside air, mixes with return air and delivers to the space. In the winter, the mixed air temperature is usually around 55ºF. In the summer, the mixed air temperature is usually around 80ºF dry bulb, 67ºF wet bulb. So, when the thermostat says it wants heating, the 55ºF air gets heated (usually up to 90-100ºF) and delivered to the space until the thermostat is happy. The heat shuts down and then the supply air drops back to the mixed air temperature. When the thermostat wants cooling, thw mixed air gets cooled down to about 55ºF and delivered to the space unti the thermostat is happy. Then the air temperature will go back up to 80ºF. This sounds like a mess, but it is inexpensive and if the Owner knows what to expect it can work. However, if there is a need to break up the one unit to serve multiple thermal zones with multiple thermostats there is only one way to do that and that is with a changeover-bypass VAV system. What happens now is that you install a motor-actuated damper (bypass damper) connecting the supply and return duct. Then you add a bunch of motor-actuated dampers (zone dampers) out in the ductwork to serve different zones in the supply duct. The bypass damper generally monitors the supply duct static pressure. As the zone dampers close, the bypass opens to prevent the static pressure from increasing. Therefore, in theory, if the system is balanced properly, you shouldn't get more air than designed through the zone damper. Usually, you have a controller that looks at all of the zone damper sensors and asks whether they want heating or cooling. Then the controller takes the vote and tells the rooftop unit what to do. When a zone damper wants heat, but the unit is in cooling, the zone damper senses the incoming temperature and goes to a minimum position to prevent a lot of heat from going through. Then, when the voting of all the zone dampers says the majority are happy, the controller switches back to the other mode and the zone damper that wants heat gets heat and opens (and all the other zone dampers close). We recently designed a project that had a VariTrac setup from 1988 and the rooftop equipment needed to be salvaged. We knew there were going to be issues, so we told everyone and indicated that we would try to resolve them as best as possible. We added pressure independent VAVs (over-sized). We added fan-powered VAVs to help mix plenum air and help trim the supply air temperatures as the units switched from heating to cooling. We upgraded the bypass dampers and designed a complete Direct Digital Control system. Before the job was complete, the rooftop units were replaced with brand new equipment that had VAV capabilities. The biggest problem is that the rooftop units have pre-canned control algorithms (and none of them include VariTrac or VVT) and the units won't operate to meet the sequence of operation outlined. Why? Well, because the newer equipment is not designed to operate like this because the new components do not need the constant volume setup that the old equipment needed. Slowly, with hard work between the Contractor and the equipment Vendor they are getting the system operating to a point where the Owner will be happy. 1. Any new systems should avoid changeover bypass VAV. There is no need for these anymore, real VAV systems are inexpensive enough today that even the Poor Men should be able to afford them. Ventilation can be controlled properly in a realy VAV system and temperatures will be more uniform. 2. If you have an existing system or existing CV system that you want more control, you can add some dampers to the system. I would first recommend looking at thermafusers and seeing if they can solve your problem. If you don't think they will help, then you need to make sure the rooftop units are zoned properly and you will need to ensure that the control system installed can provide the sequence of operation to acheive the VVT solution. Finally, ensure that the people in the space know what to expect- there will be hot air in the summer, cold air in the winter, probably some air noise. This type of system doesn't make everyone comfortable, but ensures that everyone is equally uncomfortable.